Research shown at last week’s American Geophysical Union meeting revealed that everyone’s favorite rodent has been using sticks to build dams on the Alaska’s treeless tundra. The colonization is reshaping the geography of the north and could allow other animals to follow beavers into the brave new warming world. It also comes with a downside, though. The dams create ponds that help keep beavers wet, but those ponds also contribute to melting permafrost. That releases methane and carbon dioxide, speeding us toward a hotter future. While it’s not like beavers are going to overtake humans anytime soon as the dominant drivers of climate change, the findings are another unmistakable sign of unexpected changes overtaking our planet. How scientists discovered the tundra-altering beavers is as wild as the fact that there are tundra-altering beavers. 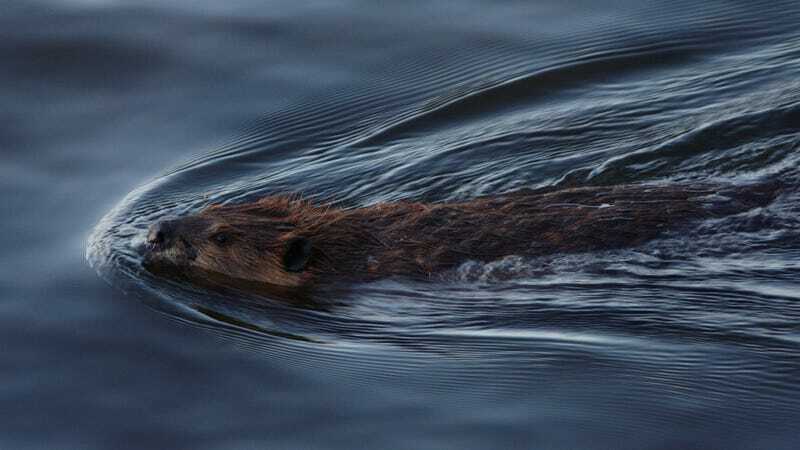 U.S. Geological Survey (USGS) researchers had a hunch something might be afoot thanks to reports of beavers on the tundra in the Canadian Arctic. So they played a game of satellite image telephone to see if there were signs of beavers on the move in three watersheds in northwest Alaska. The telephone game started with Landsat imagery, which has the advantage of being the longest-running satellite program in existence. Each pixel has a 30-meter resolution, which isn’t good enough to spot individual beaver dams and lodges. It does, however, provide enough detail to show signs of new ponds or dry areas forming on the tundra, a tell-tale sign of beaver dams. Using those clues, scientists looked at high resolution satellite imagery from Digital Globe with one-meter resolution to see what was going on at those spots and compared it to aerial images shot in the 1950s through the 1980s. “You wouldn’t think you’d be able to detect beaver activity on the tundra through Landsat, but once we have this information, we can use the very high resolution data to validate it,” Benjamin Jones, the USGS researcher leading the project, told Earther. Turns out beavers are getting busy everywhere. Of the 83 sites researchers identified as potential beaver hot spots, 60 were being impacted by beaver activity. In some cases, they could see beaver dams be built, fail, and be rebuilt again. “The beavers are very well adapted to working with what they have,” Jones said. It’s definitely clear comparing the satellite photos over the past couple decades and aerial photos from before that beaver activity now is having an impact on the tundra. Jones said the big question they need to answer is whether its positive or negative. It’s an important one to unravel in the rapidly changing Arctic, which has seen shrubs spread across the tundra, glaciers melt, and a whole slew of other changes to go along with rising temperatures. Goldfarb suggested moose might be one species to benefit. Beaver ponds could allow more willows, a favorite food of moose, to prosper in the harsh landscape and give them the ability to branch out into new areas. Jones said they’re committing to untangling those relationships (funding dependent of course) not just in the three basins they analyzed, but across the tundra from Alaska to Canada. Even if moose or other species benefit, there’s another unintended consequence of the beaver invasion. The dams they build impound water, which can contribute to thawing the icy layer of permafrost that covers much of northern Alaska. When the dams fail and the ponds drain and cause small floods downstream, that further melts out permafrost. That is distinctly bad news from a climate change perspective because permafrost releases carbon dioxide and methane as it thaws. Both greenhouse gases further turn up the planetary heat, cause more permafrost to melt, and create a terrible feedback loop of ever-worsening climate change.